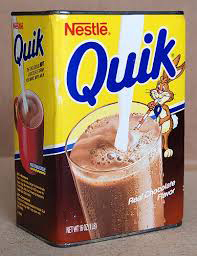 Not even sure if it exists as a product anymore, but when I was little there was a drink mix called Quik. The character on the TV commercials for selling it was a rabbit, because rabbits are quick...at least quicker than tortoises. You'd mix some the the Quik chocolate powder into milk for a chocolaty beverage. 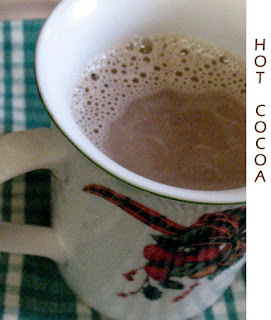 The hot version was called cocoa, but that always seemed strange to me because my Mom made hot cocoa from scratch and it was so much better than Quik cocoa. 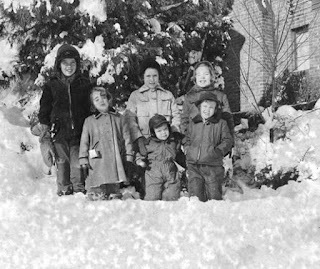 The best hot cocoa used milk from the milkman (in the early days...yes, there really were milkmen... they put glass bottles full of milk on the porch in the wee hours of the early morning before the sun was up...and later they put the milk into milk boxes, which were insulated metal boxes) and even later from gallon plastic jugs of milk from the grocery store. Mom used Hershey's unsweetened cocoa powder, sugar, and water, plus a dash of salt and a bit of vanilla once the cocoa was hot. You didn't really need marshmallows because it was so good plain, but one big marshmallow floating on the top was pretty neat, too, especially as the edges melted in the hot liquid. Sometimes we made it with canned evaporated milk, but that wasn't nearly as nice. Really luxurious hot cocoa uses at least some half and half or whipping cream but that's hard on the arteries. These days I use soy creamer or almond milk. Making hot cocoa from scratch is a sensory experience. First you have a grainy paste made with the mixture of cocoa, granulated sugar, and a bit of salt mixed with hot water. You really don't want anything other than a paste at the beginning because the cocoa powder wants to form lumps, which it will do if you add a lot of water at the beginning. Once the cocoa is wet you also get the wonderful cocoa fragrance! The paste also helps with incorporating the milk so that the mixture becomes smooth and chocolatey and now you have some dairy fragrance added. Once your cocoa is hot and you add the vanilla you have the perfect hot beverage...the vanilla adds just the right note in both flavor and smell to complement the chocolate and dairy. Little bubbles form around the edges of the mixture and it has a lovely soft brown color. The taste, of course, is the best! Try making some. The recipe is at the end. So what were the typical times when we would have cocoa? 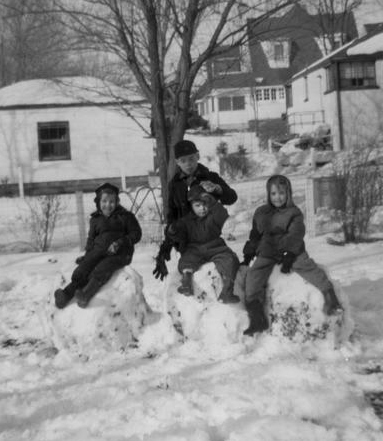 Most memorable was after we had been playing outdoors in the winter when it had snowed and was really cold. We would arrive home with chapped and reddened cheeks, shining eyes from all the fun we had, and we would proceed to shuck out of snowsuits and boots and hats and mittens and scarves. Of course before we went out we had to put all of that on and search for two boots the same size. 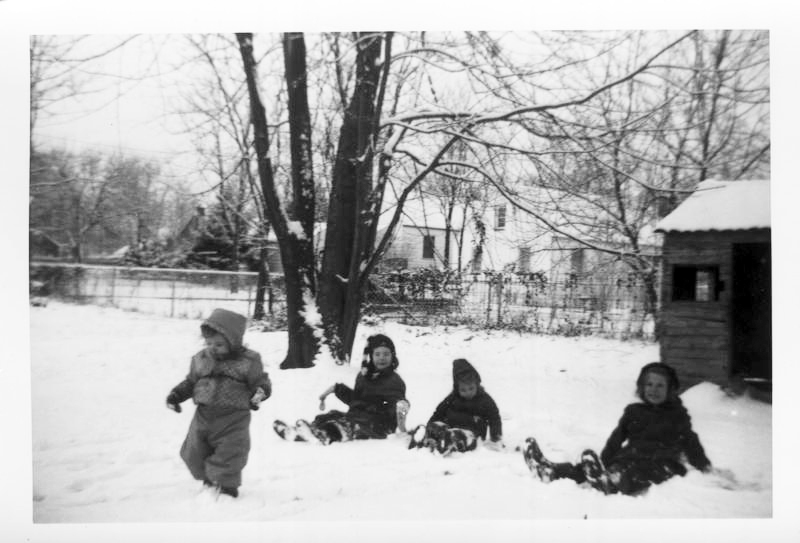 The boots were stored in the basement and we tried to keep them orderly but usually failed. The first time we needed them each year was a riot...finding two the same size could take a half hour or more of frustration. The same was true of mittens and warm gloves. One mitten or glove could be found but not the match. It wasn't just me, either. Imagine the chaos of seven or eight kids all trying to find the right outer wear at the same time! The photo below is of the oldest six of us. Look at all that gear! So what kind of fun did we have in the snow? We made snow forts and had snowball fights. 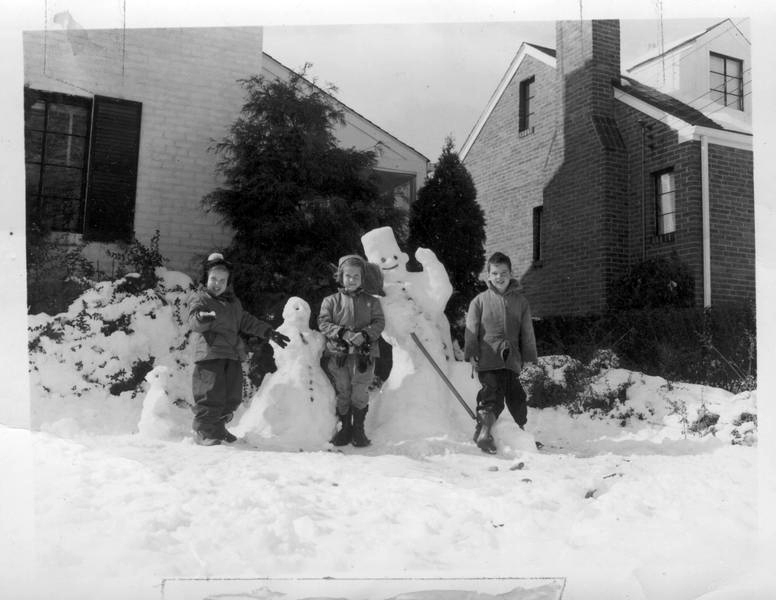 We made snowmen and snowwomen. We would drag our sleds down to the hill by the creek and slide down the hills while avoiding sliding into the creek. 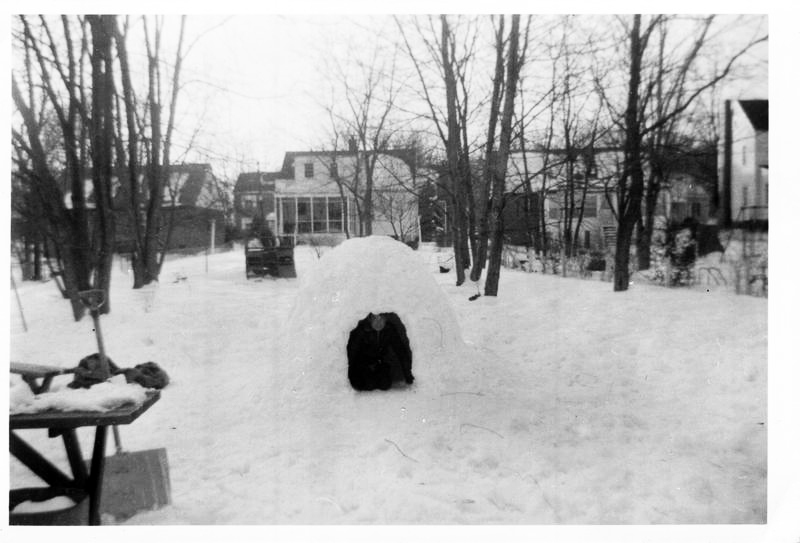 One year we made an igloo. After a long walk home from school in the winter a nice cup of hot cocoa hit the spot. It was also a great treat while doing a crossword puzzle at the round oak table in the corner of the living room. There was almost always a puzzle being put together there. At Christmas, cocoa was a great thing to accompany one of the delicious cookies. 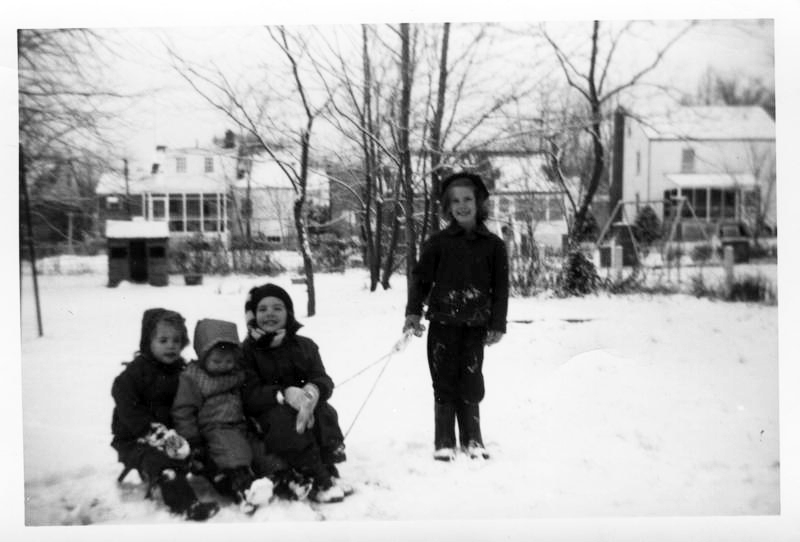 I suppose when I think of hot cocoa, the memory that is the strongest is making a batch and waiting and waiting on the cold nights when my parents would take my older sister back to nursing school in Baltimore. The younger kids were usually asleep and my older brother was away at college, so I was left in charge and waited up for them to get home, never knowing how long the trip would be. 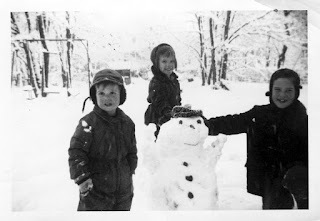 It was always a relief to see the headlights turn into the driveway and know that there was hot cocoa waiting to warm them up and welcome them home. Here is the recipe to try yourself. Welcome home! Multiply recipe by however many you are serving. In a saucepan, mix together the cocoa, sugar and salt. Make a paste with some of the hot water, then add the rest, stirring constantly, to make a smooth liquid. Heat over high heat just until it begins to simmer, then reduce heat to a simmer and simmer 1 minute, stirring constantly. Add the milk and stir to incorporate, then turn heat to high again and heat to the desired temperature to drink (some people like their hotter than others), stirring occasionally. When at the desired temperature, turn off the heat and add the vanilla. Stir. Serve in a large coffee cup or mug. One occasional treat was to get to have a marshmallow in the cocoa. You could either put it in the mug and pour the cocoa on top or add it to the poured mug of cocoa. The marshmallow would soften from the heat, and you could mix it into the cocoa or sip the cocoa through it on top, as the marshmallow gradually melted. I still make this cocoa often in wintertime, though I haven't had it with a marshmallow in quite a while. I THINK Quik still exists... Mom always made sure we had Swiss Miss for camping, so we never had it, but I think it's still out there. Nowadays, I don't get to drink much cocoa, but when I do, I try and make it from scratch. May as well make it the GOOD STUFF if you're actually going to drink it!